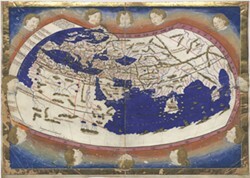 1467 map by Jacob d'Angelo, based on Ptolemy's Geographia, showing lines of latitude and longitude. Note that the map ends west of the coast of China. In February 1970, two days after arriving in Canada, I was sitting in an employment office in Vancouver. The guy on the other side of the desk said, "There's an opening at Indian Affairs. Would you be interested?" Sure, I thought, naively anticipating that I'd be working with Hindus. I only realized later the Indians in question were the folks now mostly referred to as Native, Indigenous or First Nations people. We can blame Christopher Columbus and the mapmakers he trusted for the "Indian" moniker, starting with a polymath who lived in Alexandria, Egypt in the second century. Claudius Ptolemy was a Greco-Egyptian mathematician, astronomer and geographer whose map-making skills were used by navigators well over a thousand years after his death in 170 AD. His greatest accomplishment was the Geography, in which Ptolemy combined maps of the known world, a gazetteer of 8,000 places listed by latitude and longitude, and a treatise on cartography including, crucially, how to project the Earth's curved surface onto a flat piece of paper. By the time his work resurfaced in Constantinople about 1300 AD, the maps had been lost, but Renaissance cartographers were able to reconstruct them from his gazetteer. In looking at the results, it's obvious that Ptolemy greatly overestimated the width of Eurasia. Instead of the true value of 130°, his map spanned 180° from Britain in the west to China in the east, while omitting the coast. It was only in 1295, when Marco Polo returned from his astonishing travels in Asia, that "Cipangu," as the Chinese called Japan, was made known to Europeans. 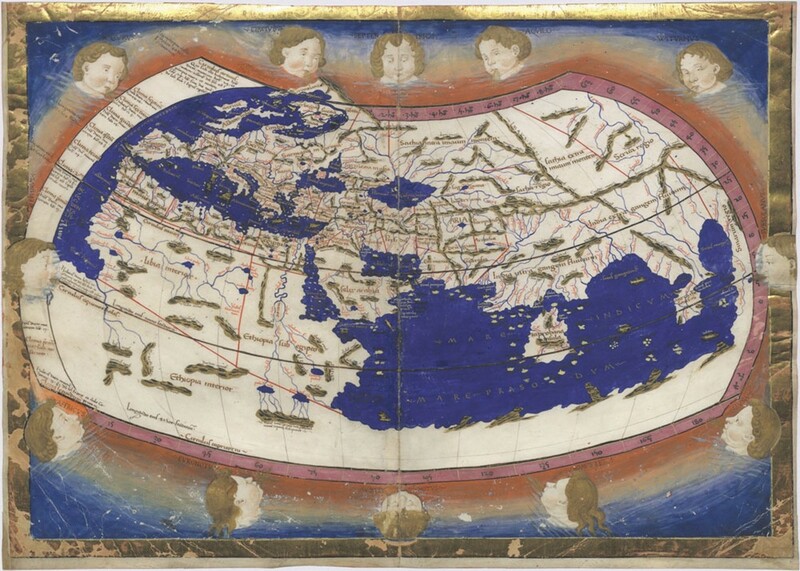 One of the first maps to incorporate Polo's knowledge was Hendricus Martellus' world map of 1491. The problem was that Marco Polo's chronicles gave very vague descriptions of geography ("... this city is five days camel journey east of that one ...") so places are only loosely located, including Japan, which he didn't visit. In addition to showing Japan (located much farther east than its actual location), Martellus' map is the first post-Ptolemy map to incorporate latitude and longitude. This made it possible for Christopher Columbus to (under-) estimate the distance from the Canary Isles to Japan in his quest to find a westerly route to the "Indies." As well as the longitudinal problem, Columbus underestimated the size of our planet. He took Earth's circumference to be 18,800 miles (rather than its actual value of 25,000 miles) due to confusion between "Arabic" and "Roman" miles. Or he may have known the true value, but chose to go along with a smaller one. Why? Because funding for his original trans-Atlantic voyage depended on his backers believing that the distance from the Canary Islands to Japan — and hence "Indies" — to be no more than 2,300 of our miles; it's actually 7,800 miles. Whatever doubts he may have had, he kept them to himself when he approached the rulers of first Portugal, then Spain, for funds. Next time, we'll look at the Martellus Map, whose "invisible ink" was recently brought to light at Yale University. Barry Evans (barryevans9@yahoo.com) quit Canada's Department of Indian Affairs and Northern Development after reading Alan Fry's How a People Die. It's still in print.